2013 was a pivotal year of growth and accomplishment for our Austin-Hackney relationship. It was the first full year since the cities joined together in a first-phase Friendship Cities agreement in January 2012. Our Committees on both sides of the Atlantic took this as a challenge to set a new bar for the speed, intensity and breadth of accomplishments that could be attained in such a short period of time by two passionate and determined new friends. Our Austin-Hackney relationship and its original Digital Trade Mission was grounded in the economic development opportunities of our similarly thriving tech sectors. But our citizen leaders immediately recognized that the deeper and most consistently sustainable value would come from establishing rich and personal relationships across a broader array of who and what our cities were as people and cultures. We purposefully went to work to layer in participation from academia, music, film, visual and performing arts, cuisine and even “3rd leg” relationships with other formal and informal Sister Cities of our communities. For focus and momentum, we targeted a single key conference in each city around which we could build a diversified exchange mission of engaged participants. In Austin that was the South By Southwest (SXSW) Interactive, Film and Music Festival. In Hackney that was the Digital Shoreditch Conference. While a powerful tech component served once again as a solid foundation to get the party started, we purposefully sought out and engaged leaders from across our cultural and educational sectors to also join in the relationship building. Fortunately with the appeal and popularity of each of our cities this was not a hard sell. Over the course of the year other individual visits were made in both directions by people with their own agendas. But in many such situations representatives of our Friendship City Committees were called upon to host and supplement the visits with additional introductions to relevant local contacts who could help the visitors establish useful new relationships where previously there had been none. Hackney Comes to Austin, SXSW, March 2013 – Austin Mayor Lee Leffingwell opened Hackney House Austin (HHA) at 119 West 6th Street on the first day of SXSW. For the next four days, this 3,000-sf venue became the ultimate Hackney-inspired workshop space. 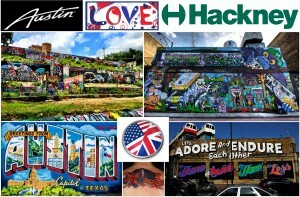 Through a carefully curated program of art, design, music, film, product and events, a delegation of some 50 people representing 25 Hackney businesses and community organizations spotlighted their work, networked with Austin friends, and promoted their culture to a global audience via Austin. Director of British Council USA in Washington, DC, Paul Smith, Visits Austin – British Council is an arm of British foreign representation which nurtures collaboration in education, culture and the arts. He spent a full day in Austin where Fred Schmidt had set up meetings with officials of three local universities, the Austin Chamber Of Commerce, City of Austin and ending in an evening of Austin-Hackney discussion and international music performance at the House Of Songs. 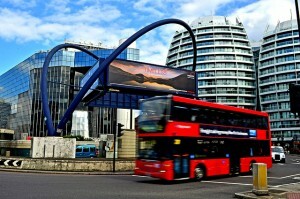 Austin Returns to Hackney, and Digital Shoreditch – Another group of Austin professionals came together during Spring 2013 to make a return trip to the Digital Shoreditch Conference in Hackney. Organized by tech entrepreneur and civic leader, Fred Schmidt, together with Natalie Betts, International Programs Manager for the City of Austin, this group was intentionally diversified in backgrounds to initiate broader direct community relationships to include academia, film, music, the arts and retail in addition to tech and government. There was even a representative from the Austin-Angers (France) Sister Cities Committee, Liz Wiley, on the team to explore potential new triangulated relationships between Austin, Angers and Hackney. At Digital Shoreditch, Fred Schmidt gave a keynote speech featuring the Austin-Hackney partnership on the main stage of the Digital Shoreditch Conference and himself took 57 meetings during his three week stay in Hackney to lay early groundwork for an even larger set of events planned for 2014. This was covered by numerous UK media outlets and Fred gave many press interviews. The Hon. Andy Pryce Receives Honorary Austinite Citizenship and Key to the City – The originator of the Austin-Hackney relationship, British Deputy Consul, Andy Pryce, of the British Consulate in Houston, was honored for work in support of the Friendship Cities partnership. 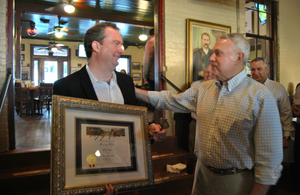 Mayor Lee Leffingwell presented Mr. Pryce with honorary Austin citizenship and a key to the City in front of a large gathering of British and Texas business and civic leaders. Read more about the Honorary Austin Citizenship for British Vice Consul, Andy Price. Austin Community College and Hackney Community College signed a formal Memorandum of Understanding between their schools in the Fall of 2013. Austin Community College and Hackney Community College entered into a formal Memorandum of Understanding between their institutions as a direct result of the Friendship Cities relationship. In addition to the typical study abroad programs and faculty exchanges, the two colleges seek to forge innovative new partnerships in workforce development programs for minority and under-served segments of their communities. The first such program announced and launched just as 2013 was coming to a close is the Millennial Mentors Program which couples business and creative student teams from the two schools to work together via online video collaboration to solve marketing challenges in reaching their demographic from top real-world companies.